We have been tracking our net worth for almost 2 years now (21 months to be exact). In that time, we have seen several of our asset classes grow, while our liabilities have dropped (except last month when we took on new debt). That is what we have been doing since first reporting our net worth numbers back in March 2015. In that time, we have seen our net worth grow to over a half of million dollars! 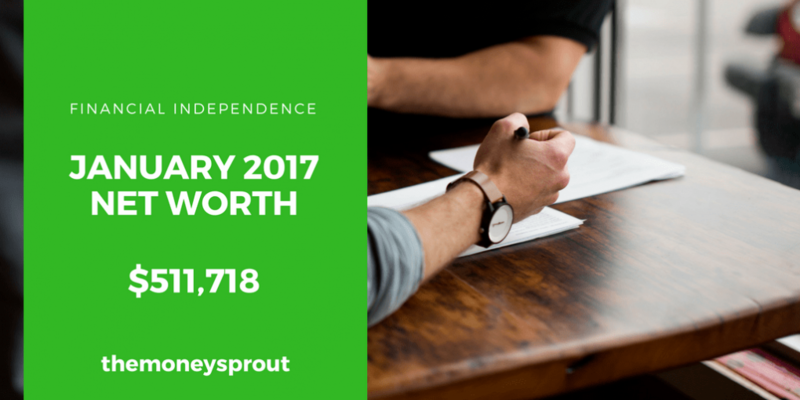 As of January 23rd, 2017 – our net worth is $511,718.16. We don’t like to post these net worth updates every month, since there is little value in frequent updates. There are a lot of moving parts to calculating ones net worth, which is why monthly updates seem to be pointless. We seem to have found a good rhythm of posting net worth updates every 2 months. So here is our most recent update, compared to our last net worth post back in November. Our net worth in January 2017 declined by (1.4%) compared to November (2016). That is a decrease of ~$7,200 over the past 2 months. The decline in net worth is a direct result of buying a new car and taking on additional debt. The majority of this increase in our investment value is from capital gains. We have also added new money to the market, which has also helped to a lesser extent. The value of our investments rose by 2.7%. We saw a big decline (-36.5%) in our cash since last reporting. The end of 2016 we had to pay our property taxes (almost $4,000), car insurance ($500+), and payoff any Christmas spending. It is hard to put much confidence in these housing value numbers. The estimates shown above are based on similar homes that have recently sold in our area. Overall, 2 out of 3 assets we report on (home and investments) saw increases. The only drop was our cash balance – which makes sense given the time of year and the payments we had due. Total assets rose by almost 1.2% since last reporting. The last category is our car loan(s). We just took on more debt a few weeks ago, when I purchased a new car. My old car died … so we sent it off to be scrapped. We ended up buying a new small car that gets over 35 mpg .. which is good for my commute to work. While I didn’t really want to take on additional debt, it was time for me to replace my old car as the ongoing maintenance costs were rising. As mentioned earlier, we took on more debt this past month … in the form of car loan #2. We have an incredibly low rate on our car loan #1 (1.56%), so it doesn’t bother me that much to make these payments. Despite taking on new debt for car loan #2 … we got a 0% rate for the entire term. So while this new vehicle will lower our overall net worth, it is a good feeling not to be paying any interest. The balance on both of these loans should drop a decent percentage each month going forward. Since we have low interest rates on both loans, we are paying a bunch of the principal off with each payment. Our credit card balances fluctuate a lot month to month. This past reporting cycle, we kept our balance about the same. Since last reporting, our mortgage balance has dropped – as expected … along with our credit card balances. I never like to see our liabilities increase. And taking on a new car loan caused our liabilities to increase by 7.5%! As I like to point out … there are 2 sides to the net worth equation. So despite our liabilities jumping the past two months, our assets increased. So with our assets increasing … we were able to “soften” the big jump in liabilities. We plan to keep these net worth posts updated about every two months. Once a month seems too frequent, but anything past a couple seems like not enough. After reviewing our net worth number for this January, it is obvious that we took a step back in building our net worth since last reporting. Buying a new car isn’t exactly a positive step towards building wealth. The good news is that our assets increased over 1%, which helped offset some of our new debt. Our net worth still dropped, but overall not that much. And we still were able to stay well above $500K. Remember, the overall goal is to grow your income while keeping your expenses low. Anything left over (aka “the gap”) needs to be invested. That is how wealth is built.